Parents who have a long list of questions about Prides Corner School sleepovers have been in a dispute with Superintendent Edward Connolly and the School Committee, with the parents unsatisfied by responses. As a fundraiser for the school, students pay $10 to stay in the school overnight, with snacks, a movie and breakfast. Under Principal Steve Harnois, Prides Corner has had sleepovers for three years. Connolly said the sleepovers were started by Harnois and not formally approved by the School Committee, though members knew about them. The boys and girls, ages 5-9, will no longer change together into sleepwear for sleepovers, a practice questioned by parents. With the election of a key member of the City Council coming Dec. 14, the Westbrook School Committee has delayed action on a plan for $10.9 million in building improvements until Wednesday. Alderman Don Richards, who has led the way to halting a string of school budget increases, faces Florence Libby in a run-off election in Ward 3 on Tuesday. They tied, 420-420, in the Nov. 2 election. The committee also delayed action on a new employment contract for Superintendent Edward Connolly. Tom Flaherty is offering a reward for a lead on the thief who stole three, 15-year-old pink flowering rhododendron plants on Thanksgiving night from Tom & Jerry’s car wash in Westbrook. Flaherty planted the bushes himself and has been pleased with their showy beauty each spring. The American Legion’s Stephen W. Manchester Post, 17 Dunn St., Westbrook, is putting in its first bar. Mayor Fred Wescott and the City Council gave permission 6-1 Monday. The post is getting a $25,000 loan from Fleet Bank for building improvements. The loan is co-signed by the city. The license is for full-time operation of a club serving beer, wine, hard liquor and catering food. The city also gave the post an entertainment license. Public works crews in Westbrook and Gorham struggled to keep up with a storm that didn’t let up all weekend and dumped about 14 inches of snow on the two communities. The storm lasted about 38 hours, from Saturday morning into late Sunday. Westbrook’s 16 public works employees had help from four police department employees. Most put in between 24 and 30 hours over the weekend. Both Westbrook’s and Gorham’s holiday tree lightings were snowed out. Westbrook’s has been rescheduled for Sunday. Gorham’s was canceled. A group of Westbrook residents has formed to work with Scarborough Downs and Penn National Gaming to get voters to approve a racino in the Dec. 30 referendum as a counter to a second group that is opposed to the plan. The pro-group is called Westbrook Citizens for Jobs and the Economy. Members include former Mayor Ken Lefebvre, former Secretary of State Mark Gartley and former Fire Chief Byron Rogers. The opposition group, Our City No Slots, has decided to work with Casinos No, the statewide anti-gambling group that helped defeat the casino proposal in November, according to Ray Richardson, who helped organize a steering committee for the group. Gorham, once a haven for new families looking for affordable housing in Greater Portland, is quickly seeing its property values rise beyond the means of first-time homebuyers. David Sawyer, town assessor, said that over the last two years, the average home value in Gorham has grown by 33 percent. In the past five years, the price of a single-family home has gone up by 60 percent, he said. He attributes the growth to both low interest rates and the solid job market in Portland. Lynn O’Leary, of O’Leary & Saxby Real Estate in Gorham, said first-time homebuyers would be lucky if they could find something suitable under $200,000. 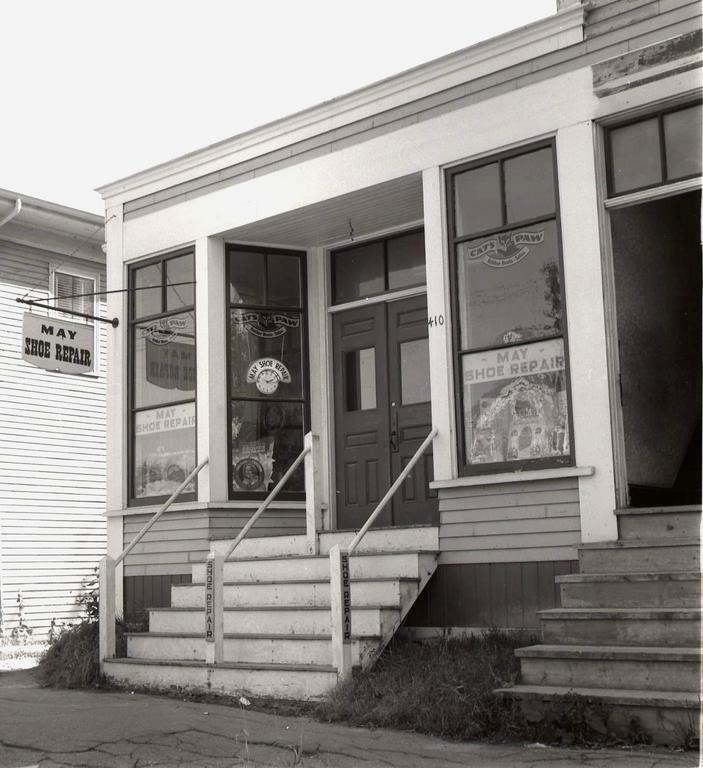 John H. May Jr. operated May’s Shoe Repair at 410 Main St. for many years. It closed around 1975 and the space remained vacant for a couple of years until Allene Bowler opened Olde Mill Crafts. When that business closed, the space was converted to an apartment. To see more historical photos and artifacts, visit the Westbrook Historical Society at the Fred C. Wescott Building, 426 Bridge St. It is open Tuesdays and Saturdays, 9 a.m.-noon, and the first Wednesday of each month at 1:30 p.m., September-June. Inquiries can be emailed to westhistorical@myfairpoint.net. The website is www.westbrookhistoricalsociety.org.